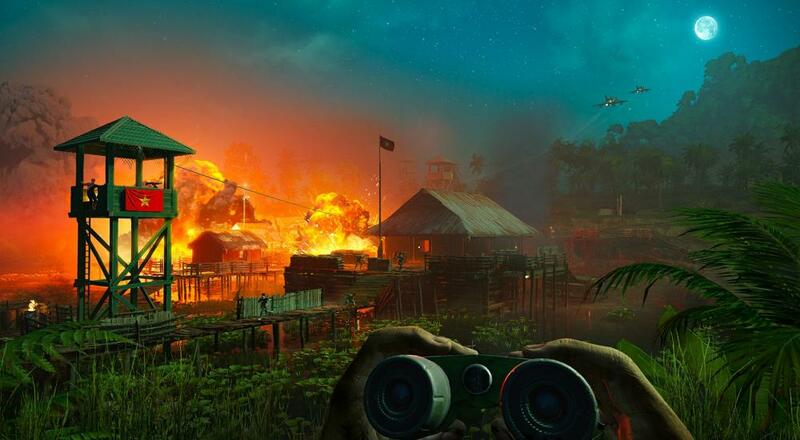 The latest installment in Ubisoft’s popular Far Cry series has a teaser trailer showing off the new Hours of Darkness DLC that has been recently released. While the video shows off very little, the description on Ubisoft’s official YouTube gives the insight that players can expect to “Escape from behind enemy lines in war-torn Vietnam and get your squad to the extraction zone!”. Far Cry 5 was released in spring of 2018 with co-op baked into the campaign all the way through. While the game itself was awarded a 3.5 out of 5 by Co-Optimus, we also gave the co-op in the game a 4 out of 5, pointing out the clunky story which can be overlooked as you romp around with a friend across Montana. The full review by Enoch Stames can be found here. Ths DLC can be picked up alone or is available to anyone who has purchased the Season Pass for Far Cry 5. While you can acquire the DLC either way, Ubisoft has given Season Pass owners Far Cry 3 for free as well, meaning that if you went into the world of Far Cry without playing the 3rd installment (which we gave an overall 5 out of 5 in our review here) now is the perfect time. Will you be paratrooping into this Vietnam-focused DLC, or are you planning to spend all of your Far Cry time stateside as you continue to explore Montana? Let us know in the comments below! Page created in 0.2696 seconds.